These fun Super Bowl party games will make your event unforgettable. You’ve sent out invitations. You’ve prepared the food and drinks. The big screen is ready to go. So what can you do to make your Super Bowl party the best ever? 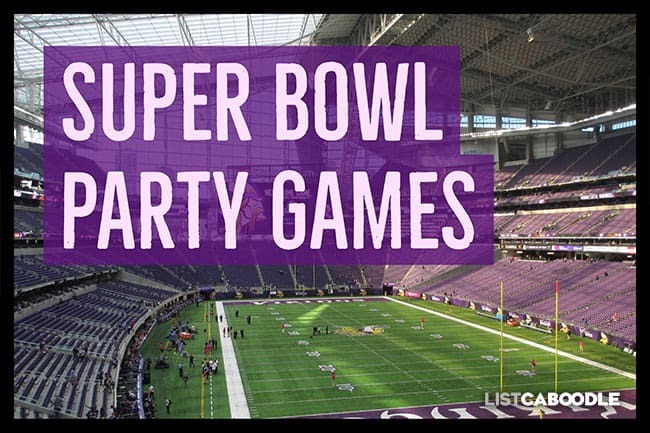 Play Super Bowl party games! Let’s face it, not all Super Bowls are great to watch. And some of your guests really don’t care about the game itself. So add a party game or two throughout the evening to keep people’s interest and add a new element of fun! What will the half time performer be wearing? How many times will the words “National Football League” be said during the game? What celebrity(s) will be shown watching the game? Which team will have the most interceptions? Will a team have over/under 300 total yards? Coin flip: Heads or tails? Will either team score three straight times? Will a kickoff or punt result in a return touchdown? Who will throw the first touchdown pass? Who will be the first touchdown scorer? Will there be a successful 2 point conversion in the game? How many QB sacks will there be (each team or both combined)? What team will score first? What color Gatorade will be poured over the winning coach? How many times will Roger Goodell be seen on camera? Write out a list of prop bet questions on a sheet of paper with room for your guests to write in their answer. Choose questions from the list above and add some of your own. Tip: Be creative! Use questions specific to star players and coaches from each participating team. Hand out the question sheets and pens before the game begins. Have party guests write down their answers. Collect the answer sheets before the coin flip. Tally results at the end of each quarter or at game’s end. Announce the winners and hand out prizes or gag gifts. Click here for a list of prize ideas. Where will Super Bowl LIV be played? The 2020 Super Bowl will be held in Miami Gardens, FL at Hard Rock Stadium. What channel will broadcast the Super Bowl? TV broadcast of the game will be on Fox. The radio broadcast will be on Westwood One. Have a football to toss around for those not playing Super Bowl party games! Get your Super Bowl party going with this trivia game. Come up with a number of questions related to past Super Bowls. You can get some ideas from the list below, or find plenty of trivia questions online. Write the questions on slips of paper or small cards. Fold the papers so the questions can not be read. Throw all the cards in a bowl and mix them up. Players take turns selecting one question from the bowl. Keep score of all the correct answers. The player with the most correct answers wins. You can even hand out prizes for runner up. This game is perfect for the lead-up to the game, half time, or post-game. Q: True or False: Network footage of the first Super Bowl does not exist. A: True, supposedly it was taped over for a soap opera. Q: Who was the first wide receiver to be awarded MVP? A: Lynn Swan of the Pittsburgh Steelers. Q: Who won the first two Super Bowls? Q: Who was the only player to be awarded MVP from the losing team? A: Chuck Howley of the Dallas Cowboys in 1971. Q: What player holds the record for most career fumbles in a Super Bowl? A: Roger Staubach fumbled five times in four Super Bowl appearances. Q: Which Jets quarterback, when asked if he preferred grass or Astroturf, replied: “I don’t know… I never smoked Astroturf”? Q: Who was the MVP of the first Super Bowl? Q: Playing for the 49ers and the Cowboys, which player has won the most Super Bowls? A: Charles Hayley, with 5 Super Bowl championships. Q: What was the first team to win five Super Bowls? A: The San Francisco 49ers became the first team to win five Super Bowls. Q: Which team made the fewest pass attempts in a single Super Bowl? A: The Miami Dolphins attempted only 7 passes during Super Bowl VIII. Q: Which team played in the most consecutive Super Bowls? A: Buffalo: ‘91, ‘92, ‘93, and ’94. They did not win any of them. Q: Who was the first player to be awarded MVP three times? A: Joe Montana (in 1982, 1985 & 1990). Q: Which two teams played in the very first Super Bowl in 1967? A: Green Bay Packers and Kansas City Chiefs. Q: Which team played 4 Super Bowls, but has never led a Super Bowl for even a single second? Q: What was the lowest amount of points scored in a Super Bowl? A: 3 (Miami Dolphins, 1972 Super Bowl against Dallas). Q: Out of the 32 NFL teams, how many teams have made it to the Super Bowl? A: 23 total. 13 from AFC and 10 from NFC. Q: Three people appeared in a Super Bowl as a player, an assistant coach, and then a head coach. Who are they? A: Dan Reeves, Mike Ditka and Tony Dungy. Kickoff for Super Bowl LIV (the 54th big game) is usually around 5:30 p.m. (central) on February 2, 2020 from Miami, Florida. Where can I buy tickets for the Super Bowl? Check out NFL On Location for tickets and ticketing information. Where will the next five Super Bowl games be played? Bet on the score of the game and win money or prizes! This game is a variation on the well-known Betting Squares game and requires fewer players. Grab a deck of cards and separate out one suit. You’ll need the following cards from the suit: Ace (representing 1), 2, 3, 4, 5, 6, 7, 8, 9 and King (representing 0). (You won’t need the 10, Jack or Queen.) Turn the cards over so the fronts cannot be seen. Have each player select a card for $1, $5 or $10 each. At the end of each quarter or at game’s end, the game score determines the winner of the pot. To determine a winner, just add the two team’s scores together to get the winning number. The last digit represents the winner. For example, if the score is 21-7, the winning card would be the 8. If the score is 10-0, the winning card is the King. (The King card represents zero.) If more cards are needed, you can add another suit to the mix, however the pot will split for multiple players holding the winning number. Add some great food to your Super Bowl party games! The Super Bowl is all about eating and having fun with friends. Have each participating guest bring their own prepared food item and see who will earn the title of Super Chef! You’ll need to set some parameters for the competition first. Decide what food items will qualify, like ribs, dips, pizza or deserts. You can make the competition about one category or make it open to any food category. Guests can either prepare food in advance or at the party, if space and time allow. Have your guests rate each dish on a scale of 1 to 5, then tally the results to determine the Super Chef. Pick a type of football play, like a screen pass or long-bomb pass play. Pass a cup after every play. Each player adds a dollar to the cup. When the chosen play occurs, the player holding the cup wins the all the money. That player chooses a new play and passes the cup to start a new round. You can change the sequence from every play to every first down or every scoring play or change of possession. This may be easier to track and less expensive to participate. If you really want your Super Bowl party to come off the rails, try the Magic Word Drinking Game. Technically, there is no winner or loser but just a fun twist to watching the game. Choose a word (or person’s name) before the game starts. Each time the word is spoken during the broadcast, players must drink. You can control how much drinking takes place by how obscure the word or name is. For example, the starting QB’s name will be mentioned frequently and the backup QB hardly at all. Or you may choose to tie drinking to actions on the field. For example, players must drink after each touchdown, or drink twice for each interception or fumble. Create teams to compete against each other by putting the drinking words into a hat or bowl. Have players take turns picking a word out of the hat. If the word is mentioned during the broadcast, that team must drink. Remember to be safe and don’t drink and drive. Set up a classic game like electronic football along with your Super Bowl party games! Print out each team’s roster and cut apart each name so you can mix them up in a hat or bowl. (You may want to fold them over so the names can’t be seen.) Have participants choose a name from the hat for $1 each. When a touchdown is scored, the guest with the matching name wins the pot. If all the names are not sold, the pot carries over to the next touchdown scorer. Tip: You may choose to limit the number of roster names depending on the number of guests you have. Include only players most likely to handle the ball or remove some lesser-used players from the roster. In this game every party guest guesses the final score and winner of the Super Bowl game. The person closest to the actual score wins. You can provide a prize for the winner, or have each participant contribute money to the pot—winner take all. To determine who wins, start with only those who correctly picked the winning team. Then determine the point differential for each score guessed. The lowest number wins. For example, if player A guessed a score of 28-14 with the actual score 21-14, the differential is 7. If player B guessed a score of 23-21, the differential is 9 and player A wins with a lower number. These Super Bowl party games are sure to spice up your football party. You’ll make the evening even more fun and keep guests interested even if the game is a bust. May the best team win! Sports fan? You might also like: The best, strangest and most colorful baseball nicknames.